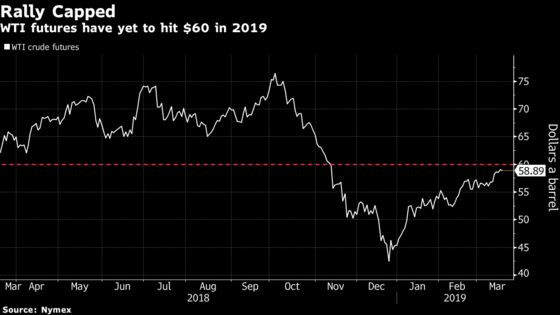 (Bloomberg) -- Oil’s rally stalled after some U.S. officials were said to fear a Chinese pushback in trade negotiations between the world’s two largest energy consumers. Futures were little changed at the close in New York after erasing earlier gains as new concerns over the trade talks cast a shadow over the outlook for global growth and demand for crude. An American Petroleum Institute report that was said to show U.S. crude stockpiles declined 2.13 million barrels last week wasn’t enough to lift prices much in after-hours trading. West Texas Intermediate for April delivery traded at $58.93 a barrel at 4:39 p.m. after settling at $59.03 on the New York Mercantile Exchange. Brent for May settlement gained 7 cents to $67.61 a barrel on the London-based ICE Futures Europe exchange. A committee of the so-called OPEC+ group on Monday recommended canceling a planned ministerial meeting in April, saying it would be too soon to determine whether the output cuts should continue into the second half of the year. The change in timing, which still needs to be agreed by the wider coalition, means the group probably won’t decide on an extension until late June, just days before they expire. The industry-funded API was said to report gasoline supplies fell 2.79 million barrels last week. Nationwide distillate stockpiles and crude storage in Cushing, Oklahoma, also declined. Analysts were expecting government data due Wednesday to show that crude inventories rose by 1.75 million barrels last week, according to the median in a Bloomberg survey. Gasoline futures gained 0.6 percent to settle at $1.8931. Citi analysts write that OPEC+’s Baku meeting makes $75 a barrel Brent crude more likely. Alberta is loosening oil production limits for a third time this year as prices for the Canadian province’s heavy crude have rallied. The cap will be raised by 25,000 barrels a day in May and a further 25,000 the following month, bringing it to 3.71 million barrels a day on June 1. By the end of this year, a cumulative 270,000 barrels a day of diesel demand will have been displaced by electric buses, most of it in China, according to a report published Tuesday by BloombergNEF.